After recently giving my WebStarts review a good old update, I thought it was time I compared it against its peers to see how it stacks up. For it’s first head-to-head, WebStarts will be going up against Wix which I’ve come to think of as the industry standard in do-it-yourself website builders. Today, I’ll dig deep to present you with the similarities between these two platforms and more importantly, the main differences with the sole aim of helping you make an informed decision. 8. Pricing – Is There a Huge Difference? 9. Conclusion – And We Have a Winner! This first section is all about the templates which act as a starting point for your new website. Both WebStarts and Wix also offer a blank canvas theme if you’d rather start from scratch. Webstarts has just over 100+ designs spanning categories such as business, health & fitness, beauty, animals & pets plus several others. The templates are modern, professional looking, and while they do their job, I find it difficult to get excited about them. While you can customize the basic site colors and text styles, you’re fairly restricted as to where you can move certain elements and the confines of the template soon become apparent. Wix has almost 5 times the selection compared to WebStarts and they are of a very high-quality. You’ll find they’re divided into similar categories but you can drill down into a given category to help you find just the right design for your business or project. For example, I clicked on the Restaurant category and a second menu appeared offering subcategories such as catering & chef, cafe & bakery, restaurant, bar & club, and food & drink. When it comes to customizing your chosen theme, you’re placed firmly in the driving seat. You can pick up text, pictures, and forms and place them wherever you darn well please! Just be careful not to stray too far away from the original design if you’re new to this as you could quite easily drive visitors away rather than attract them. This is harder to do with WebStarts as you don’t have as much freedom which is sometimes a blessing in disguise. Templates Summary: Wix wins this section hands down. I can say with complete confidence that there really is something for everyone. If you’re in the trenches running your business or getting it off the ground, the last thing you want to be doing is spending weeks trying to figure out how the website builder actually works right? This isn’t something you’ll need to worry about with either of these two platforms. Before you get stuck in over at WebStarts, you’ll be greeted by a video which will walk you through how everything works. It’s definitely worth watching as it’ll save you time later. But even without the video, I feel that the website editor’s pretty self-explanatory. You work using two main menus where you’ll go to add new pages, change colors, or add new images etc. You only have to point and click on any existing text or pictures to begin making your changes. With the conventional method, the website editor took me longer to get used to than with WebStarts for the simple reason that you have more options available to help you customize your site. My best advice is to spend 10 or 15 minutes exploring the tools and settings and you’ll soon get used to everything. The second way is by using Wix ADI which you can choose after creating your free account. Wix is one of only a few builders to offer this feature and it allows you to get a customized website by answering a series of questions about your business or project. Then, you sit back and let Wix take the strain. This method works best if there’s already existing information online that Wix can pull-in to your site but it’s still worth testing either way. Once you have your site, you can then make changes manually until you’re happy and ready to go live. Regardless of whether you choose WebStarts or Wix, your site will automatically shrink-down to fit smaller screens and tablets (WebStarts requires you to be a Pro Plus member, more on pricing further down). If you wish to dive in and make alterations to the mobile version of your site, then both platforms offer a separate mobile editor to help you do just that. A feature often neglected by their competitors. From personal experience, these mobile editors can be a little cumbersome at times but it’s nice to have the option even if you don’t intend to use it right off the bat. Mobile Summary: Your website will automatically be mobile-friendly regardless of your choice (depending on your plan with Webstarts). Both allow you to customize your mobile site separately if you wish. WebStarts has a fairly basic feature set which is part of the reason it doesn’t take much time to settle in. In the top menu, you’ll find a small app store and this is where you’ll find features that you can add to your site such as social media follow buttons, calendar, and video integration. WebStarts also allows you to create a basic membership site which is something you don’t find with many other website builders (nice touch guys!). Wix, on the other hand, is one of the most versatile website builders out there. This is possible thanks to their App Market which is larger than WebStarts’ and contains over 260 add-on features all of which can easily be bolted-on to your site. You’ll find tools to help you manage and grow your business such as a Quickbooks integration, or you can connect with customers in real time by using live chat software. There are also tools to help you promote your new websites such as social media integration, a native email marketing platform, and we haven’t even scratched the surface! Just keep in mind that not all apps are free. Some come with a lite version or free trial and you’ll need to upgrade to unlock additional features. 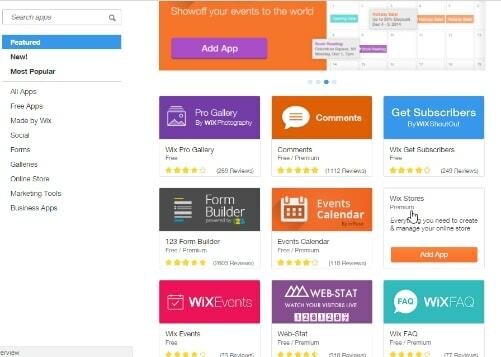 Features summary: Wix takes 1st place again in this section thanks to their app store which contains hundreds of features making it easily the more versatile between the two. WebStarts offers a blog which can be added to your site with just a couple of clicks from the main menu. You can create new posts, add images or video, display the date it was published as well as the author name. It works perfectly well for the occasional post but if you intend to blog regularly, you may be left wanting more features which I’d class as standard requirements. Wix has a fairly solid blogging platform but you probably already guessed I was going to say that right? It’s easy to stay organized as you can organize your posts by category, add tags, schedule your posts to automatically publish at a set time and visitors can leave comments to share their thoughts or views. Blogging summary: WebStarts is great for the occasional post but if you intend to focus strongly on blogging, Wix is the stronger option. Before we look at eCommerce features, I’d like to point out that I wouldn’t recommend either if you’re going to be selling hundreds of products. In which case, I’d recommend Weebly for a medium-sized store or a specialist eCommerce platform such as Shopify for larger stores. Having said that, for something a little more modest, both WebStarts and Wix have an interesting offering. 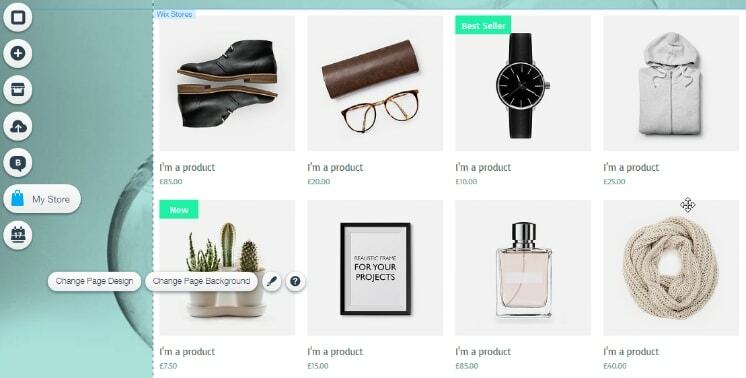 WebStarts makes it easy to get your shop set-up and start selling both physical or digital products online. I’m pleased to say that I found the shopping cart as straightforward as the main website editor and you won’t end up frustrated with complicated settings or endless menus. You’ll be able to manage your inventory, apply tax and shipping rates, offer customer discounts, and accept payments through Stripe or PayPal. Another cool feature is the ability to import or export product details from a .csv file. This makes it a lot easier to bring over products if you’re moving to WebStarts or if you move away down the line. Wix doesn’t have an option to import or export products which I find a real shame. It’s one of the reasons I don’t recommend it for larger stores. Having said that, for smaller stores, it packs a powerful punch. You can easily integrate a store into an existing Wix site or choose one of their dedicated templates if you’re starting from scratch. Tax and shipping settings aren’t set in stone and can be adjusted depending on the customers’ location. You’ll also have the ability to showcase sale products or end of line ranges. Thanks to the fully integrated newsletter platform, it’s easy to send a follow-up email thanking your customers for their purchase and contact them in the future informing them of special offers and discounts. eCommerce summary: WebStarts makes it much easier to work with a large number of products thanks to their import/export feature. Other than that, the tools and features feel quite basic compared to Wix. If you find yourself in a pickle, your first port of call should be the video and written tutorial which both providers offer. WebStarts offers customer support through email or live chat. Wix also offers email support or you can request a call back from a member of the support team. I have to say, although I’ve received timely help from Wix in the past, they don’t make it easy to find their contact details and you’ll have to trawl through the knowledge base to get to them which I’ve always found rather annoying. Support Summary: Both offer email support and a way to get live help. By design, Wix makes it harder to find their contact details and encourages you to find your own answers first. WebStarts and Wix both have a free plan available which in my opinion is great for testing purposes or personal websites. They’re not ideal for professional sites as you’ll have the company branding within your domain name (yourwebsite@webstarts.com) and you’ll have ads displayed on your site. Note: The prices mentioned below are the monthly costs when you choose an annual plan and pay upfront for the year. 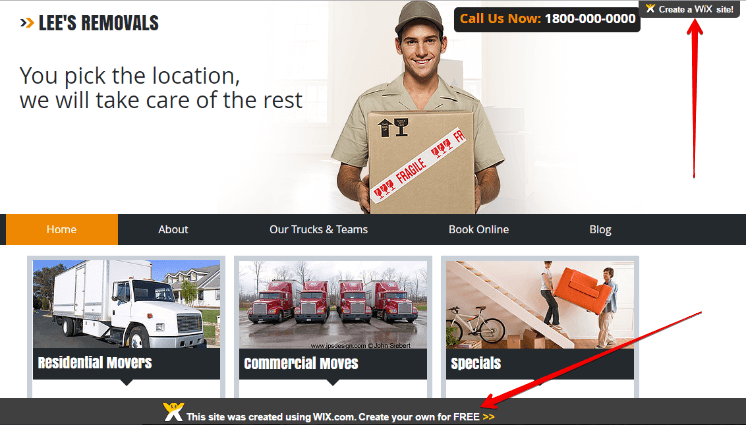 WebStarts doesn’t offer a pay-monthly option, Wix does but it costs a little more when choosing that option. WebStarts premium plans range from $4.89 to $19.99/month. If you want your website to work correctly on mobile devices (which you really do), you’ll need the Pro Plus plan at $7.16/month. Wix’s plans range from $5 to $25/month but the cheapest plan (connect domain), doesn’t really bring much to the table as you’ll still have to put up with those annoying ads. To remove them, you’ll need the combo plan at $10/month which should be enough for most websites that don’t sell products. For an online store, you’ll need the eCommerce plan at $17/month. Both offer a free custom domain name (yourwebsite.com) for the first year with an annual plan (approx $20 value). Pricing summary: The pricing is fairly even. WebStarts is a couple of dollars cheaper for a standard website whereas Wix is slightly cheaper for a store. Wix has pay-monthly plans available. When I first sat down to write this comparison, my initial thoughts were that it was going to be a little more even than it actually turned out to be. With that in mind, I crown Wix as today’ overall winner as they beat WebStarts in the majority of categories. Both WebStarts and Wix are fairly evenly priced and have good customer support platforms. They’re also both mobile friendly. WebStarts is a little less daunting at first if you’re creating your site in the conventional way and it’s easier to find the contact details when you need help. They also make it easier to work with a large number of products when creating a store (read full review). 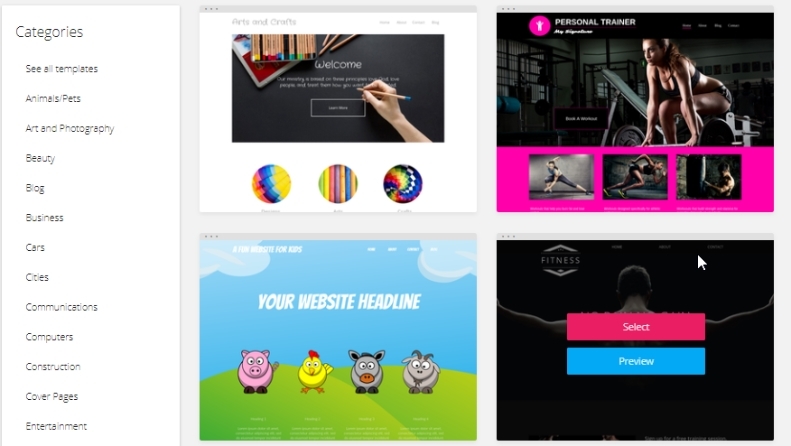 Wix has over 500 beautiful templates filled with sample content which you can quickly swap out for your own. Although it takes a little longer to find your way around, you’ll have much more control over the end result. Besides, if you choose to create your site with Wix ADI, this negates the learning curve anyway. In addition, Wix has a stronger blogging platform and more powerful eCommerce tools for smaller stores (read full review). You can get started for free with WebStarts here, or Wix here. Spend a little time with them an make sure they’re right for you before committing. Do you have questions? Maybe you have experience with either WebStarts or Wix and you’d like to share your thoughts? If so, I’d love to hear from you. You can get in touch using the comments section below! Great article! I was wondering if there are any free website options that are free and give you a free custom domain name? Hey Woody, unfortunately, I’m yet to come across a website builder that offers a free custom domain name. Even if you use a cheaper alternative such as Namecheap you’ll usually be required to purchase a premium plan before they’ll allow you to connect it to your website. Sorry I couldn’t be more help here. Well, actually I prefer WebStarts over Wix. Person like me who starting new business and have strict budget. WebStarts give an option where we can enter our own domain and no charges. Were Wix still ask for premium plane even if we enter our own domain. Hey MK, I can’t argue with you there! Wix do insist on signing up to one of their premium plans to be able to use your own domain, as do most website builders actually. You can do that with Wix’s cheapest plan, the “Connect Domain” plan but that’s all that plan really offers (which I find a little annoying). Webstarts definitely stand out from the crowd in that area. Thanks for stopping by to share your thoughts.